The final phase of the impressive new roundabout on Cooil Road has been happening overnight for the last few weeks to cause minimum disruption. Hartford Homes, contracting for Eden Park Developments, has been working round the clock to deliver the new roundabout. 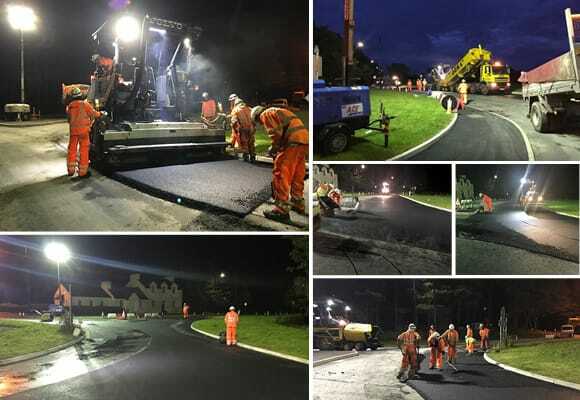 Commenting on this major scheme, a Hartford Homes director said: “This second phase has been completed during a series of overnight shifts in order to cause minimum disruption and has involved final tarmac laying, improved bus stop and lay-by facilities. The new roundabout has been fully funded by Eden Park Developments and will soon be serving the landmark Jacksons and Motor Mall multi-car showroom complex at Eden Business Park.